The American Pit Bull Terrier was the mascot for Buster Brown Shoes because of the breed’s strong and sturdy appearance. These intelligent dogs are loyal, gentle, and courageous. Because they are confident, eager to please, and affectionate, Pit Bulls can make excellent family companions, and they get along tremendously well with children they know well. 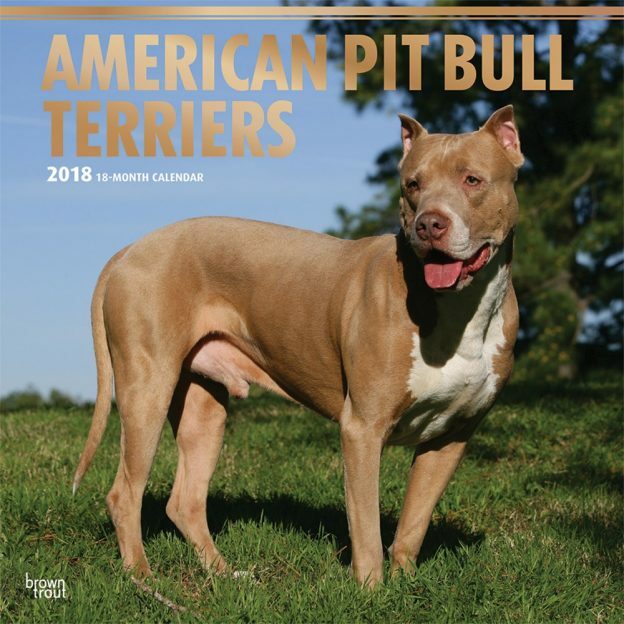 This American Pit Bull Terriers square wall calendar is perfect for the person who loves these wonderful dogs. Includes a free download of the DogDays™ app for the smartphone and tablet, which grants access to the world’s most captivating dog photos and backgrounds, fun puzzles, and a calendar featuring your favorite furry friends. This entry was posted in Calendar Showcase, Dog Breed on April 22, 2018 by dogdaysapp.